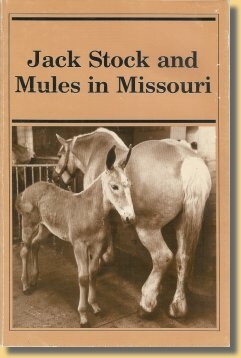 Originally published as "History of Jack Stock and Mules in Missouri"
by the Missouri State Board of Agriculture, August 1924.
won the Mare-Foal Class later that day. The mare had accomplished the same thing the previous year of 1981 with an earlier mare mule foal and would repeat again with a third in 1983. The two-week-old foal's head and ears have been clipped to better show its style, quality and large, well-set ears. A comprehensive effort to document Missouri Mule History is currently in progress at the University of Missouri-Columbia. The Missouri Mule History Project was begun in 1982 with the goal of publishing four or five books and/or booklets about this remarkable animal. To finance the project, the Missouri Mule Skinners Society, 109 Whitten Hall, was created with membership certificates selling for $25.00 each. A friendly press called attention to the project and friends of mules from far and wide offered support, encouragement and knowledge. With the philosophy that the best information comes from the "mule's mouth," Professors Duane Dailey, Photojournalist, and Melvin Bradley, Animal Scientist, armed themselves with camera and tape recorder and documented the mule experiences of 130 "old- timers." These recorded interviews will eventually become apart of the Archives of the University of Missouri for future generations to learn of their rich mule heritage from the voices of these "salty" old-timers who created it. Photo Records of the Guyton and Harrington Mule Company Properties. The era of draft animal dependency is over. Those who experienced it are senior citizens and are rapidly declining in numbers. By the close of the 20th century most old-time mule men will be gone. With their passing will go much experience and most of the knowledge of draft mules and of the mule industry as it was at its zenith. Unless we hurry, apart of our rich heritage will be lost. Plans are progressing to capture part of it in the next four years with a comprehensive book and two or three more booklets about mules. Missouri, the country's leading mule breeding state, has a very rich, but scantily documented, mule heritage. Mules have contributed more to this state than to any other. They farmed our land, harvested our timber, drained our swamps, built our roads and took us to church and to war. Further, sale of mule foals bought our winter groceries, clothed our school children and paid our taxes, while home-raised matched spans made substantial payments on the purchase of our farms and other major commodities. 1. Ashton did not familiarize himself enough with data that refuted the need for "hot-blood" in most mule mares. Indeed, he supported it. 2. He did not defend Missouri breeders, who led the nation in every segment of mule and jack stock production, against snubs by contemporary Kentucky writers. Data to support these contentions are presented. 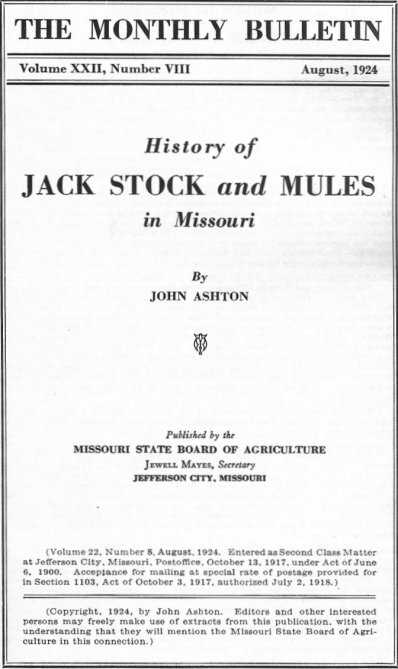 Despite these small complaints, "A History of Jack Stock and Mules in Missouri" is the best information ever written on this topic. At this late date, it is likely to remain so. The writer takes this opportunity of thanking breeders and relatives of past breeders for data which could not have been obtained otherwise. He would have liked to have made the personal sketches even more representative, but certain breeders have not seen fit to respond to requests for information, hence the omission of details concerning some prominent men. On the other hand, a few breeders of jack stock and some mule feeders have taken great interest in this work, thus compensating in a degree for the indifference of others. Doubtless it would have been a simple matter to have gotten data by visiting each one, but this was out of the question as it would have involved too much expense. It is not generally realized that these Histories, if they are to be of any permanent value, should be written with every care and only after an exhaustive study of all available sources. It was hoped by the writer to have been able to use many more photographs and also more subject matter, but insufficiency of funds prevented this. So far as Missouri is concerned, however, except for some unimportant details, everything has been included according to plan. In cases where photographs have had to be returned without using, those who have been good enough to send them will kindly accept this, the only explanation. The Missouri State Board of Agriculture, with a multitude of interests to serve, is trying to have published the histories of the various breeds and categories of farm stock which have made this State famous. Whether these modest publications are worth the work and money spent in compiling them is another question which time will answer. The author is deeply grateful to all those correspondents throughout the country who have written in generous appreciation of the other Histories of this series already published, and also to the press for sacrificing valuable space in noticing them. (Signed) JOHN ASHTON, June, 1924. Columbia, Missouri.